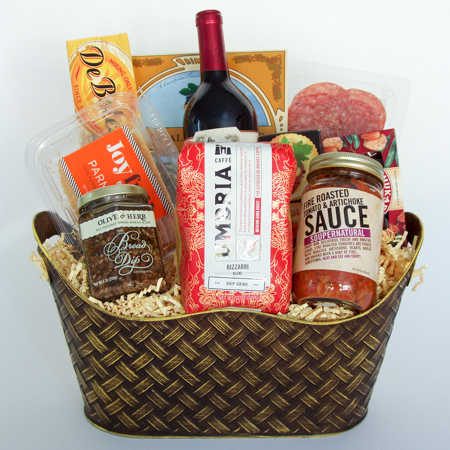 Toast their new home, new life together, new job or just about any occasion with this Gourmet Pasta Gift Basket that feeds the whole family including SouperNatural’s Fire Roasted Tomato and Artichoke Pasta Sauce, DeBoles Organic Spaghetti, Joyful Parmesan Crisps, Sliced Italian Dry Salami, Bread Co. Olive & Herb Spread, Elki’s Crackers, Ste. Michelle Cabernet Wine, Umbria Italian Roast Coffee, Mocha Wine Wafers and Chukar Chocolate Covered Almonds. Arranged in a handsome home decor metal tin. Delicious! Available with wine, champagne or sparkling cider.